Hawaiian Chicken is a heavenly, polynesian-style dish that’s amazing! 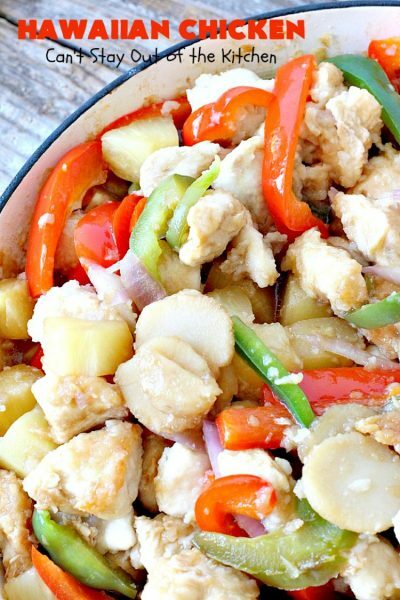 Lots of chicken, pineapple, green peppers, onions and water chestnuts in a delicious sweet soy sauce mixture. 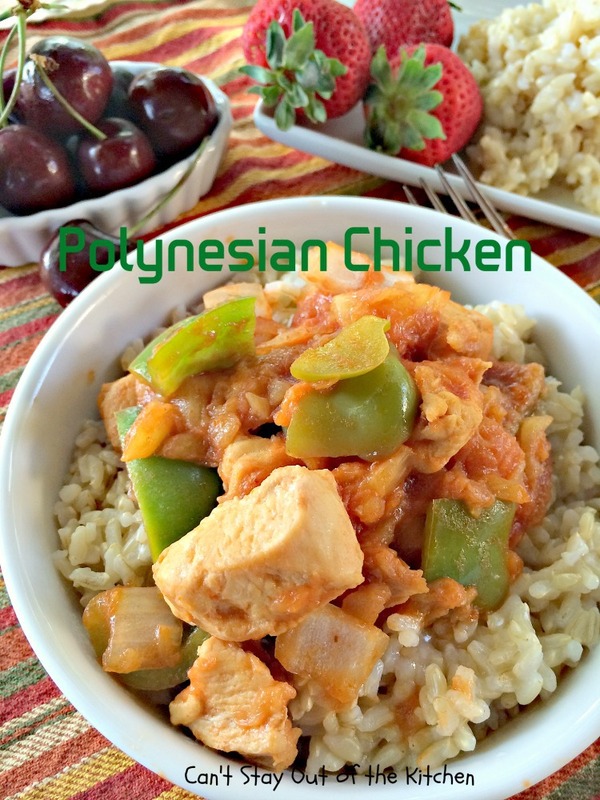 Serve Hawaiian Chicken over rice and you are in for a fabulous treat. This recipe is gluten free and dairy free. It’s also loaded with taste! It doesn’t take too long to prepare either — about a half hour, so it’s good to get your rice cooking right away. Back in 1979 some friends of ours from church had us over for dinner one night and Bonnie served this wonderful dish. 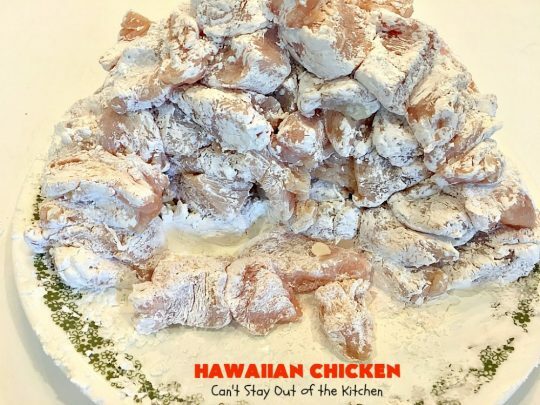 They had just eaten this same dish at Chuck and Kathy Waldorf’s home about two weeks prior – and so we’ve just kept on passing this delicious chicken recipe to others over the years. Back in 1979, grocery stores didn’t sell boneless, skinless, chicken breasts like they do now. We had to cut the meat off the bone ourselves! It is so much easier purchasing the meat for this recipe nowadays! 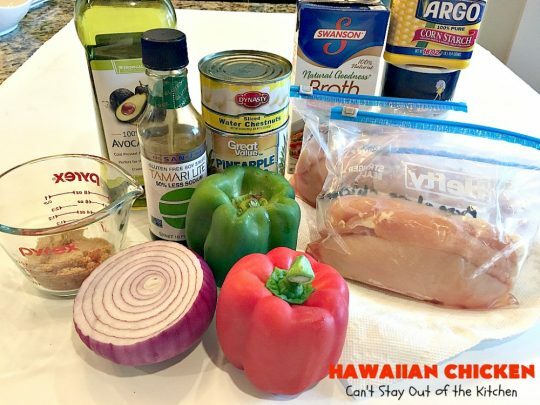 If you’re in the mood for a delectable chicken entree, then consider trying out my Hawaiian Chicken recipe sometime soon. It’s terrific. It’s great for summer fare when you don’t want to heat up your oven and because this only takes about a half hour your stove top isn’t going too long either. 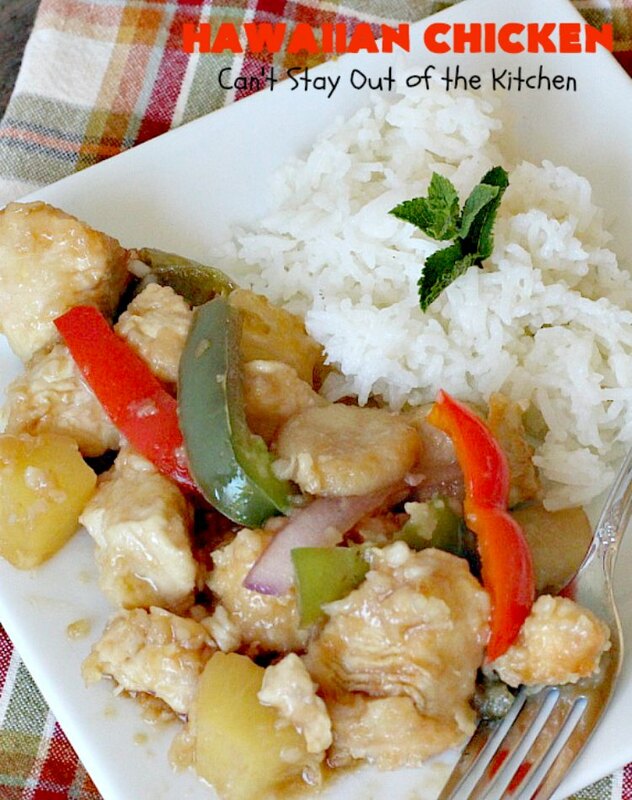 When I initially posted this recipe in July 2013, I wasn’t very happy with my pictures. It was late in the day and the sun was hanging low in the sky. It caused the colors to be really off and tinged more yellow and orange than I like. I recently remade this recipe (May 2017) for friends in our care group. We host several families every Friday night for dinner, Bible study and prayer. I decided to give this tasty recipe a whirl and it was very well received. I think you’ll enjoy it too. Hawaiian Chicken is a wonderful Polynesian-style main dish recipe. The nice thing about Hawaiian Chicken for those with food allergies is this entree is both gluten free and dairy free. We serve this dish over plump, whole grain brown rice or basmati rice. Hawaiian Chicken is an elegant dish to serve company, but we like it for family dinners, too. This recipe serves 6 easily. 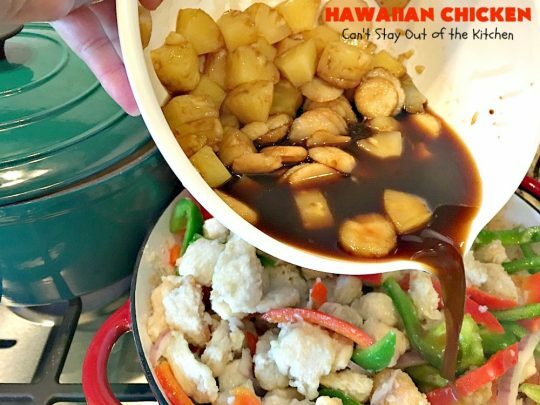 The sauce in Hawaiian chicken is savory due to the soy sauce and chicken stock, and sweet due to the pineapple, pineapple juice, and brown sugar. It’s a wonderful blend of flavors. 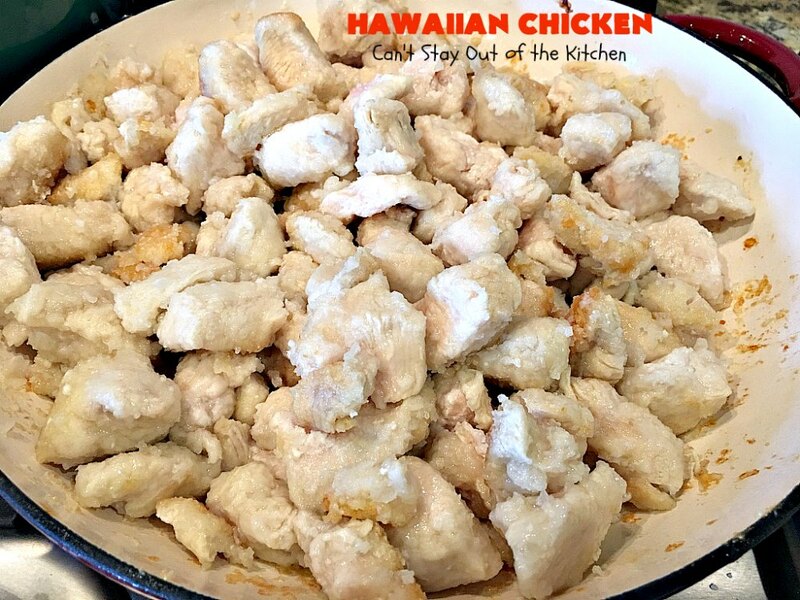 Cut four to six boneless, skinless chicken breasts down into bite-sized pieces. Dredge chicken pieces in cornstarch. The recipe originally called for 1/4 cup. I know I used at least 1 full cup plus some, in order to get all the meat dredged properly! Heat oil in extra large skillet or sauteuse pan. (I love using enameled cast iron). 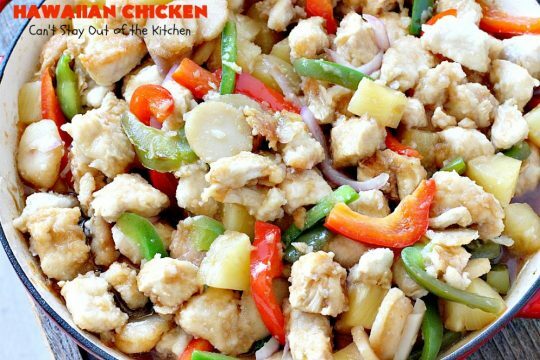 Place chicken pieces in hot oil and saute 7-10 minutes over medium heat until chicken pieces are cooked through. 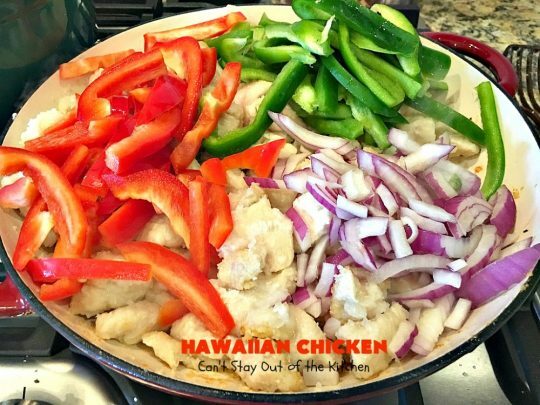 Using a lid may help to cook the chicken pieces through more quickly. You will have to stir frequently to prevent chicken from sticking. Meanwhile, make sauce: Pour the contents of a can of pineapple chunks and juice into a mixing bowl. Add water chestnuts. 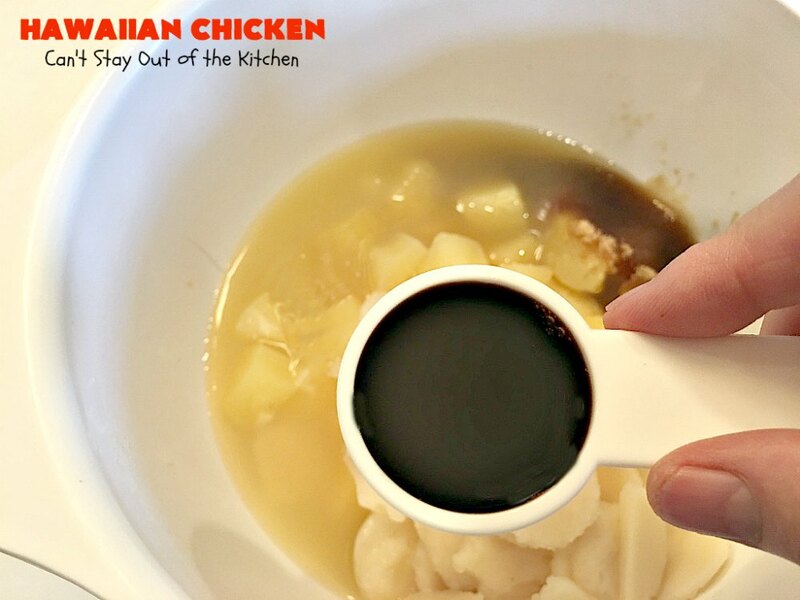 Add soy sauce, heaping tablespoonfuls of brown sugar, chicken stock and salt and stir ingredients to combine. Meanwhile, Cut onions and bell peppers into strips. 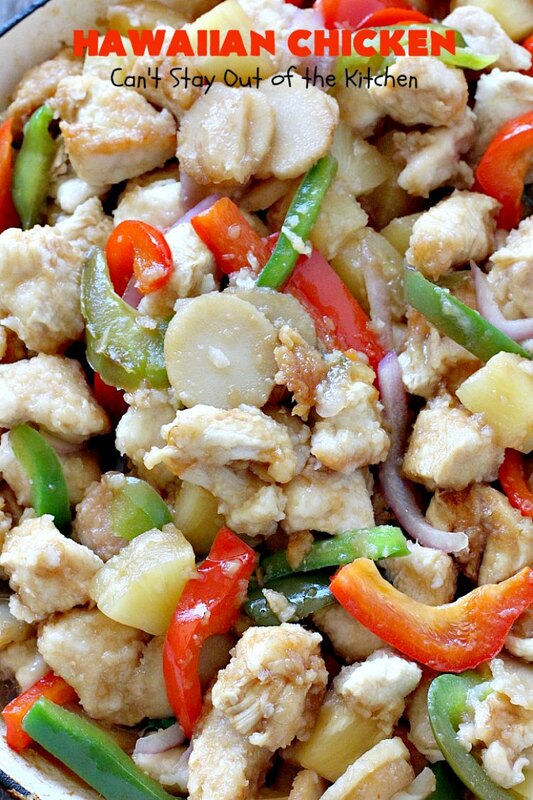 Once chicken has cooked add red and green pepper strips and onion strips. Stir to combine and saute about 5 minutes. Add pineapple, soy sauce, water chestnut mixture and cook until sauce thickens. Saute until all the veggies are cooked and the sauce is thickened – 10 minutes or so. 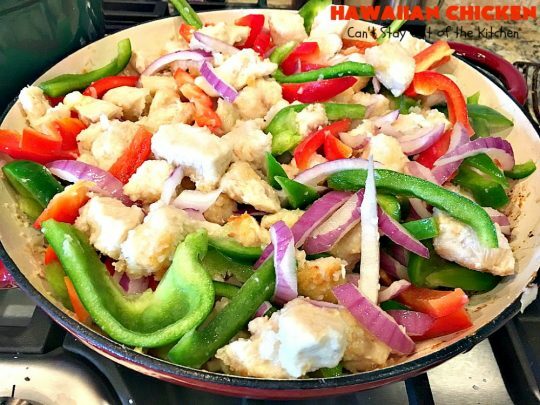 Here’s a serving of Hawaiian Chicken. Hawaiian Chicken is filled with bell peppers, onions, pineapples and water chestnuts to provide great crunch, texture, and flavors. This is an easy meal to whip up during summer days because you don’t have to use your oven! It also takes only about 30-40 minutes making it really convenient for weekday dinners. 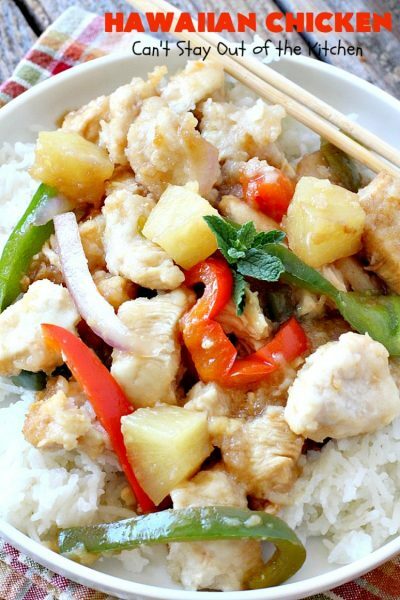 Amazing Polynesian style chicken main dish with peppers, pineapple and water chestnuts in a tasty soy sauce. 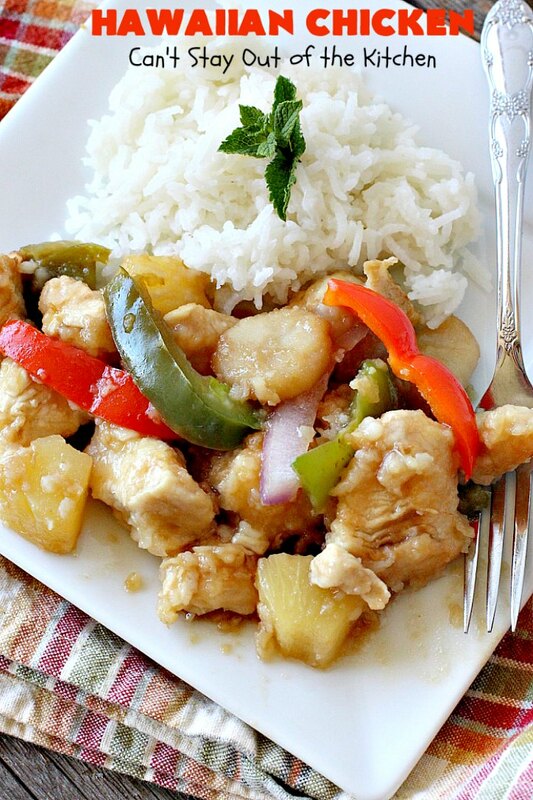 Serve with hot, cooked rice. Cook quickly until meat is opaque. Add red and green bell peppers and onion strips. Stir and cook 3 minutes. Combine stock, salt, soy sauce, pineapple, water chestnuts and brown sugar. Cook until thick, about 5-10 minutes. NOTE: If the sauce thickens too much, you can add up to an additional cup of water or chicken stock to dilute some. Add green pepper and onion strips. Because I drained the water chestnuts, I added an extra cup of water in the recipe because the sauce thickened up in about a minute! Then I let the sauce cook until thick again – about 5-10 minutes longer. 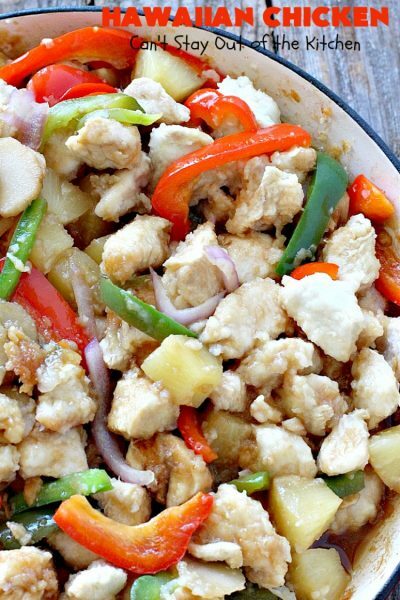 This delicious chicken dinner can be made up fairly quickly. It takes longer to cook the rice than the main dish! Serve Hawaiian Chicken with chopsticks! It’s a great way to teach your kids dexterity. I’ve been obsessed with adding fruit to meat and salad dishes this year. 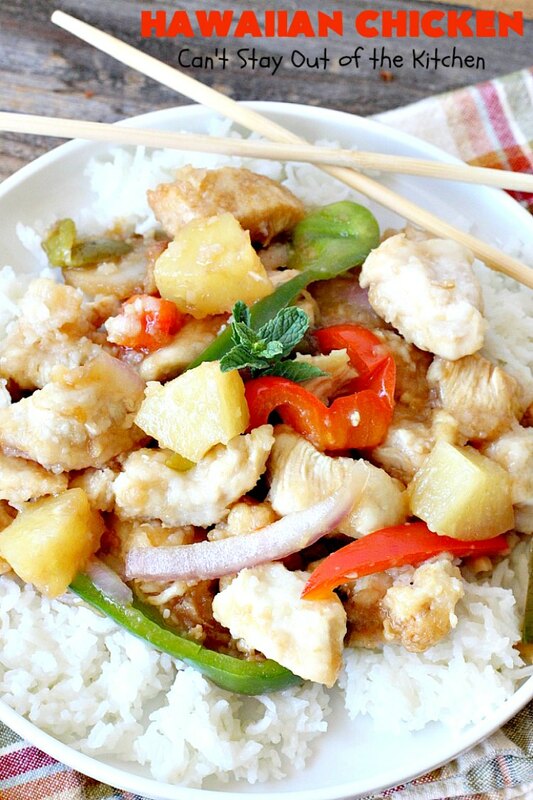 I need to make this recipe the next time hubby brings home a pineapple. It’s good grilled in slices, but we have so much leftover with just two of us here. I could use the rest of the grilled pineapple in this dish! Yes, it really is a delicious dish. I have quite a few salad recipes where I use pineapple too.